Ventricular fibrillation occurs when the individual muscles of the heart contract in a random, uncoordinated way. The heart appears to shiver, and blood circulation ceases. Ventricular fibrillation is fatal unless normal heart contraction is quickly restored. As early as 1899 Prevost and Batelli were able to stop ventricular fibrillation in a dog. They did this by applying an electric shock to the animal's exposed heart. Beck successfully used this technique on a human patient in 1947. In 1957 William B. Kouwenhoven, an American electrical engineer at Johns Hopkins University in Baltimore, Maryland, developed a closed-chest defibrillator. The unit was first tested on a dog. It sent electrical shocks to the heart through electrodes placed on the animal's chest. American cardiologist Paul Zoll applied this alternating current defibrillator to human patients in 1961. 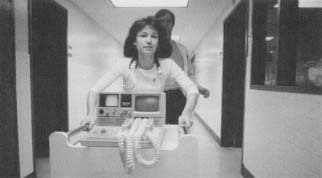 The direct current defibrillator introduced by Lown and Neuman in 1962 provided greater reliability and safety. Defibrillators greatly improve the ability of patients to survive when their heart starts to fibrillate (rapidly contract). Heart surgery, invasive cardiac diagnostic and treatment techniques, and heart attacks all may trigger fibrillation. Since the 1970s, most hospital emergency rooms have been equipped with electric defibrillators. Portable devices are becoming standard equipment for ambulances. Automatic defibrillators have been developed that detect abnormal heartbeats and deliver the appropriate electrical shocks. Unlike standard defibrillators, these devices can be used by operators with much less training than paramedics. They can be used by on-site personnel such as firefighters before paramedics arrive. Defibrillators greatly improve the ability of patients to survive when their heart starts to fibrillate, or rapidly contract. An implantable device to stop heart arrhythmias was invented by Mieczyslaw Mirowski at Johns Hopkins. Mirowski's automatic implantable cardioverter defibrillator (AICD) was approved for use by the Food and Drug Administration (FDA) in 1985. It senses two kinds of abnormal heart rhythms and automatically sends an electric shock to the heart to correct the disturbance. As a defibrillator, the device jolts the heart out of ventricular fibrillation. As a cardioverter, it shocks the heart out of an abnormally fast heartbeat. The AICD requires more power than the standard cardiac pacemaker (an electronic mechanism inserted into the heart that regulates heartbeat). Its battery pack is separately implanted in the patient's abdomen (the part of the body between the diaphragm and the pelvis). Lithium batteries can deliver 100 to 150 shocks during their three-year lifetime. The AICD is a potential lifesaver for the 700,000 people in the United States who survive heart attacks each year. These people are at risk for potentially fatal arrhythmias. The AICD is also routinely used for patients whose arrhythmias cannot be treated with medication or surgery.